Why climate predictions are so difficult | Climate Etc. An insightful interview with Bjorn Stevens. Excerpts provided below, with some minor editing of the translation. It’s a simple number, but it will determine the fate of this planet. It’s easy to describe, but tricky to calculate. The researchers call them “climate sensitivity”. It indicates how much the average temperature on Earth warms up when the concentration of greenhouse gases in the atmosphere doubles. Back in the 1970s, it was determined using primitive computer models. The researchers came to the conclusion that their value is likely somewhere between 1.5 and 4.5 degrees. This result has not changed until today, about 40 years later. And that’s exactly the problem. The computational power of computers has risen many millions of dollars, but the prediction of global warming is as imprecise as ever. “It is deeply frustrating,” says Bjorn Stevens of the Hamburg Max Planck Institute for Meteorology. For more than 20 years he has been researching in the field of climate modeling. It is not easy to convey this failure to the public. Stevens wants to be honest, he does not want to cover up any problems. Nevertheless, he does not want people to think that the latest decades of climate research have been in vain. As a decision-making aid in the construction of dykes and drainage channels the climate models are unsuitable. “Our computers do not even predict with certainty whether the glaciers in the Alps will increase or decrease,” explains Stevens. The difficulties he and his fellow researchers face can be summed up in one word: clouds. The mountains of water vapor slowly moving across the sky are the bane of all climate researchers. First of all, it is the enormous diversity of its manifestations that makes clouds so unpredictable. Each of these types of clouds has a different effect on the climate. And above all: they have a strong effect. Simulating natural processes in the computer is always particularly sensitive when small causes produce great effects. For no other factor in the climatic events, this is as true as for the clouds. If the fractional coverage of low-level clouds fell by only four percentage points, it would suddenly be two degrees warmer worldwide. The overall temperature effect, which was considered just acceptable in the Paris Agreement, is thus caused by four percentage points of clouds – no wonder that binding predictions are not easy to make. In addition, the formation of clouds depends heavily on the local conditions. But even the most modern climate models, which indeed map the entire planet, are still blind to such small-scale processes. Scientists’ model calculations have become more and more complex over the past 50 years, but the principle has remained the same. Researchers are programming the earth as faithfully as possible into their computers and specifying how much the sun shines in which region of the world. Then they look how the temperature on their model earth adjusts itself. The large-scale climatic events are well represented by climate models. However, problems are caused by the small-scale details: the air turbulence above the sea surface, for example, or the wake vortices that leave mountains in the passing fronts. Above all, the clouds: The researchers can not evaporate the water in their models, rise and condense, as it does in reality. You have to make do with more or less plausible rules of thumb. “Parametrization” is the name of the procedure, but the researchers know that, in reality, this is the name of a chronic disease that has affected all of their climate models. Often, different parameterizations deliver drastically divergent results. Arctic temperatures, for example, are sometimes more than ten degrees apart in the various models. This makes any forecast of ice cover seem like mere reading of tea leaves. “We need a new strategy,” says Stevens. He sees himself as obliged to give better decision support to a society threatened by climate change. “We need new ideas,” says Tapio Schneider from Caltech in Pasadena, California. The Hamburg Max Planck researcher has therefore turned to another type of cloud, the cumulonimbus. These are mighty thunderclouds, which at times, dark and threatening, rise higher than any mountain range to the edge of the stratosphere. Although this type of cloud has a comparatively small influence on the average temperature of the earth, Stevens explains. Because they reflect about as much solar radiation into space as they hold on the other hand from the earth radiated heat. But cumulonimbus clouds are also an important climatic factor. Because these clouds transport energy. If their number or their distribution changes, this can contribute to the displacement of large weather systems or entire climatic zones. Above all, one feature makes Stevens’ powerfully spectacular cumulonimbus clouds interesting: They are dominated by powerful convection currents that swirl generously enough to be predictable for modern supercomputers. The researcher has high hopes for a new generation of climate models that are currently being launched. While most of its predecessors put a grid with a resolution of about one hundred kilometers over the ground for calculations, these new models have reduced the mesh size to five or even fewer kilometers. To test their reliability, Stevens, together with colleagues in Japan and the US, carried out a first comparison simulation. It turned out that these models represent the tropical storm systems quite well. It therefore seems that this critical part of the climate change process will be more predictable in the future. 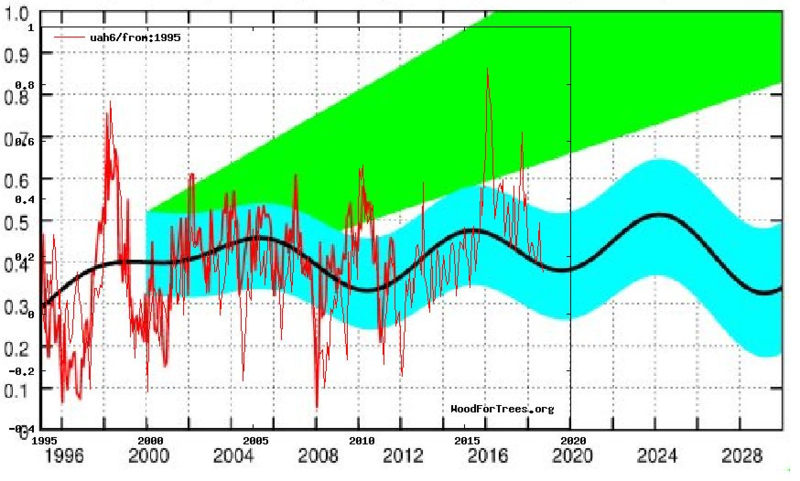 However, the simulated period was initially only 40 days. “Stevens knows that to portray climate change, he has to run the models for 40 years. Until then it is still a long way. Stevens, meanwhile, rather fears that it is the cumulonimbus clouds that could unexpectedly cause surprises. Tropical storm systems are notorious for their unpredictability. “The monsoon, for example, could be prone to sudden changes,” he says. That’s the worst of all possibilities. Because then mankind continues to steer into the unknown. This entry was posted in climate models, Prediction, Sensitivity & feedbacks. Bookmark the permalink. Predictions are difficult, especially about the future. Recall IPCC’s TAR chapter 14 about “coupled non-linear chaotic system” being impossible to know future states of ?? Being mathematically impossible may be part of the explanation of climate predictions being wrong. “The difficult we do at once, the impossible takes a little longer” doesn’t apply to these guys. Here lies the basic problem in CliSci, especially for UN IPCC climate modeling: Most of those involved in the field, if not all, fundamentally believe in the existence of high ECS for man-produced “greenhouse” gasses. Their work is designed to prove that assumption; “better decision support” means convincing politicians that they need to radically alter our society, economy and energy systems. This is the ultimate goal supported by the Third World-dominated SJW UN. A telling point is the admission by the UN IPCC climate modelers that they adjust multiple parameters until they get an ECS that “seems right.” If I am reading things correctly, the CMIP6 models to be used in the UN IPCC’s AR6 will push average ECS up even higher than CMIP5 models. Not unlike Vegas funding predictive computer models to weigh betting odds in their favor, If those models are funded by governments the intent will be to give politicians and bureaucrats the justification to take more power and control over our lives. Bureaucrats, by their human nature, are conditioned to use taxpayer dollars for government benefit not the individuals laying down the money. That made me laugh twice as much. Every time the output of an unvalidated UN IPCC computer model is referred to as an ‘experiment’ I cringe. As we have communicated in the past, Dr. Curry, unvalidated UN IPCC computer models are not sufficient to alter our society, economy and energy systems. They had these models in the 1970s too, but the newspapers of the day would often as not feature someone from MIT scoffing at the idea they could predict anything. The second paragraph makes the first one a lie. Which of our multiple and intertwined food chains are declining due to their inability to reproduce in their warming environments? How quickly? How many have been contaminated, by the 90,000+ man-made chemicals we’ve been dumping into our spaceship’s biosphere, beyond their ability to reproduce? Memory is dim and Google skills not up to the task but I want to say that one of the original weather/climate predicting program attempts in the early 1960’s had a number of constants and 9 variable inputs. That primitive program produced non-linear, unpredictable results. SDOIC although certainly present, did not fully explain variability. Indeed, researchers of the time spent months combing through the computer and code for errors. I read about this at least 25 years ago when working on a proprietary AI compiler (akin to Prolog but with syntax and relationships dedicated to a commercial application). I have not yet seen any technical explanation I’ve waded into (usually with a large degree of whining and moaning on my part) or other poly-syllabic hand waving that has explained how increasing the number of variables can improve precision in an inherently chaotic problem. While it is possible to produce a more accurate predictive signal in the short term, the accuracy and resolution of the plot is always subject to degradation as time increases. I am always amazed at the fact that scientists neglect to define “doubling of CO2” The non-scientists assume that it is doubling the present day value of 400 ppm to 800 ppm No wonder there is confusion by lawmakers. Time to get on the same page please. Read any of the various UN IPCC or U.S. agencies’ reports on climate issues. It quickly becomes apparent that they are scary political sales documents, not scientific reports. They lie when they state that climate metrics such as hurricanes, floods, droughts, tornadoes, etc. are worsening through man’s activities. Available public data shows no statistical changes in such climatic parameters. … and then I read through the comments. Willis, you got there first! One of the things that surely any scientist should recognise is that if your results continually fail to match observations then you are barking up the wrong tree. It doesn’t matter how special your tree looks – it’s the wrong tree. Oh, the old “what else could it be” argument. I’m sure there’s clever latin name for this fallacy but let’s just call it pseudo-science, anti-science or science denial. “The Hamburg Max Planck researcher has therefore turned to another type of cloud, the cumulonimbus. These are mighty thunderclouds, which at times, dark and threatening, rise higher than any mountain range to the edge of the stratosphere. I think this reminds me of your thermostat thesis W E. But with some addition. He says : “Although this type of cloud has a comparatively small influence on the average temperature of the earth” , just before explaining that they “transport energy”. Like transporting energy from the surface to the tropopause can not affect the surface temperature. If thunderheads block solar incoming radiation during day and increase transport of energy to the top of the atmosphere TOA (via latent heat,) day or night, then they absolutely expel more heat from the planet then they trap. If a warming climates produce more thunderheads then it’s an unacknowledged negative feedback to global warming. The 100K grid models do not look at this at all, as Steven’s pointed out. This is long-known criticism of IPCC GCMs. There will come a time when the opponent on the other side of your argument will defeat you with your own ideas and logic. Please note, the AI system described in the article does not attempt to win arguments to decide what is truth or morally right. It’s goal is to win by using every advantage it has against it’s human opponent. Enjoy the time we have left to argue against each other. This post brings to mind Pat Franks error propagation analysis (https://www.youtube.com/watch?v=THg6vGGRpvA) that never got accepted by modelers in the peer review process for publication even when several reviewers thought it was worth printing. I still think he has it right and the models are not able to reduce the uncertainty enough to be useful for predictive purposes. Assumptions. When one builds a system that only works if the assumption is correct, a more precise system based upon the wrong assumption will get the answer wrong. If one assumes that CO2 is a control knob for climate change, then all present climate models, no matter how precise and diligently adjusted will give the wrong answer. The wrong answer: climate sensitivity of 1.5 to 4.5C is the computer output for doubling of atmospheric CO2. I am reminded that Copernicus made the calculations of planetary movements correctly when he assumed that the earth revolved around the sun and not the other way around. There were many mathematicians in the Papal orbit around that time that just, almost, got calculations to prove the sun revolved around the earth per Papal theologian’s assumption. Galileo’s telescope proved Copernicus’s calculations correct. We are enmeshed in a scientific squabble urged on by modern day theologians to prove the CO2 control knob hypothesis is correct. That is our assumption and there are many calculations that…just…might… lead us to an answer. If only we had more and faster computers, getting grid size down too..maybe the molecule, then we could prove our hypothesis. What is getting in the way of our conformational bias? climate sensitivity, and the agendas attached to this current consensus hypothesis. We need other assumptions and a new device to make observations. We have enough data, we have enough observations. We have 800 thousand years of ice core data from Antarctica. We have 150 thousand years of Greenland NEEM ice core data and a hundred thousand yeas of other Greenland ice core data. We have millions of years of other proxy data. We have over a hundred years of thermometer data. Many people understand some of the correlations. We need to work together instead of against each other to put the different understanding of the many pieces together. Climate is not chaotic, it seems chaotic when you only consider part of the factors. One does not prove they are right and another is wrong, that has not worked. One must get others to put their piece in the proper place in the puzzle and see the whole picture together. The completed picture will not have chaos included. Every thing that happens in the universe is natural, even people and what we do is part of that natural universe. Even man caused CO2 is part of nature. We have causes man made CO2 since man breathed out his or her first breath or started the first man started fire. When you don’t absolutely know all the variables and one of those variables (clouds) has infinite characteristics, all the computing power in the world still leaves you chasing your tail. But don’t tell them that. They won’t believe it anyway. Why would they believe something that is wrong? It’s clear that climate models are getting more and more precise without getting more accurate. Your shooting may be so precise that all your shots cluster in a one-inch circle, but that circle is two feet away from the bullseye. So long as outgoing radiation is the same as incoming, which is all we know currently (Operation Earthshine), it’s all smoke and mirrors — I don’t see what more or faster super computers will add. They will add more precision. Outgoing radiation is the same as incoming, but sometimes the outgoing is more or less IR out and less or more albedo reflection out. When there is more IR out, part of that is producing snowfall. The more evaporation is cooling the surface and the more IR out is removing the energy that produces the ice. Negative energy is being stored in the sequestered ice while the stored energy in the oceans is powering the process. In cold times, the oceans have much sea ice cover and are gaining energy while the sequestered ice provides the cooling by thawing and reflecting and the negative energy sequestered ice capacitor is discharging. Energy in balances energy out but the positive energy in the oceans and the negative energy in the sequestered ice flows in different directions. Some people did begin to understand positive heat energy is stored in the oceans but it may be many years before that they understand that negative energy is stored in sequestered ice. This energy is always flowing in both directions, but sometimes more one way and sometimes more the other way and that is why there are long term not well understood cycles. People study the short term correlations to death but almost no one understands that when ice thaws, it chills the oceans and land. Warm tropical ocean currents flow into polar regions when there is sea ice cover and it cannot cool by evaporation. It is chilled by the thawing ice it contacts and gets the coldest when IR out is the least. The oceans are the warmest when IR out that cools it is the most. You will not find a calculation in any climate scientists papers of cooling by thawing, not since Ewing and Donn. True, true… you have to go back 60 years to predictions of a coming ice age in the ’50s. Now we have a publication discussing progress in applying the latter approach using thermodynamic concepts in the effort to model climate processes.. The article is A new diagnostic tool for water, energy and entropy budgets in climate models by Valerio Lembo, Frank Lunkeit, and Valerio Lucarini February 14, 2019. Abstract: This work presents a novel diagnostic tool for studying the thermodynamics of the climate systems with a wide range of applications,from sensitivity studies to model tuning. It includes a number of modules for assessing the internal energy budget, the hydrological cycle,the Lorenz Energy Cycle and the material entropy production, respectively. In particular, it is obvious, as of today, that it is more efficient to approach the problem of constructing a theory of climate dynamics starting from the framework of past actual data and extend what occurred over the most recent ten thousands of years to the thousands of years forward until a real factor changes, not just one molecule in ten thousand molecules of the atmosphere. To pick one flawed model over another flawed model is just picking which wrong method you want to fail with. Now I will read your links and if it changes my mind, I will say so. If reading those links do not change my mind, I will say so. The Holy Grail of climate forecasting is accurately modelling convective processes in climate sensitive regions, e.g. the tropics. Song, Wang and Tang suggest that the Pause was caused by a reduction in deep convective processes in the tropics precipitated by the dominance of La Nina conditions. The decrease in cloud cover in this region, resulting in a significant decrease in the overall greenhouse effect, was enough to offset the increase in the global greenhouse effect, according to these authors. 2. It is next to impossible to accurately incorporate convective processes on the local scale into global circulation models. 3. We know so little about the precise effects that different types of cloud have on the total (incoming SWR and outgoing LWR) energy budget, how frequently those types of clouds appear during the diurnal cycle, how they vary in time and space over longer periods and consequently how they respond to both anthropogenic and natural forcings on various timescales. Ron, Your blog post is interesting. What is the source for your plot of TMT vs. models? RSS v4 partially took care of that problem using faulty satellite data. You now have to use UAH v6 to get a believable comparison. Yes. Here is a current UAH vs. CMIP5 comparison, Green area is range of forecasts from CMIP5 models. Turquoise area is forecast from Scafetta astronomical climate model. Red is UAHv6. 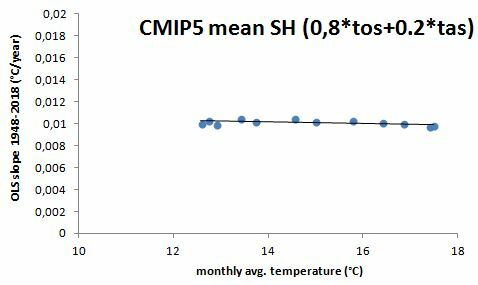 It is worth remembering in these graphs that CMIP5 models produced hindcasting results for years prior to 2005 and forecasting 2005 forward. And their hindcasts were also off from measured. They knew the values and still missed them! Screwing around with aerosol and cloud parameters still couldn’t produce a reliable result. 100 years out? I read, I did not change my mind. It is obvious, as of today, if you don’t know how to approach the problem of constructing a theory of climate dynamics, then you do not understand all the important factors. That’s actually evidence of them becoming stupider over time. Might not all this new understanding and computing power be better used to try and model, predict and possibly control localized weather, rather than model, predict and control the world’s climate? Super computers and AI? I imagine these will be great for evolving fractal patterns everywhere – but it takes a brain to see a whole larger than its parts. The committee was a bevy of distinguished geophysicists – a field far older than climate science – and has authority coming out of its ears. The people who locked up Galileo for the remainder of his life and made him say what he wrote was untrue was one of those distinguished groups that had authority coming out of their ears. History is full of this stuff. The whole is never larger than the parts. The whole is always equal to all the parts if you have all the parts. When the whole is larger than the parts, you have missing parts. If the whole is larger than the parts, you have parts that do not belong or that are wrong. One should read that and conclude, there is something in the way natural internal cycles respond to external forcing that the scientists totally do not understand. It snows more when oceans are warm and thawed and evaporating and sequestered ice increases. Increased volume and weight of ice expands the ice extent and cooling. They do not understand, or even suspect this happens. How could anyone read about this interview and even suspect they know enough to be trusted with any kind of forecast. “The accuracy of the predictions has not improved, but our confidence in them has grown,” he says. That is sick logic! Go find out why the predictions have not improved. You have something important very wrong or missing. Ice core data has the answers, you do not understand evaporation, snowfall, ice sequestering and ice depletion, it happens and it is not included in your models. mankind continues to steer into the unknown. Some do, and some study past data and history and steer into repeats of what has happened many times before. “Stevens knows that to portray climate change, he has to run the models for 40 years. Until then it is still a long way. I know that modern climate cycles are thousand year cycles. Which 40 years is he running his models for? The researchers can not evaporate the water in their models, rise and condense, as it does in reality. You have to make do with more or less just making stuff up. They get some, after the fact, correlations but no proof that it is well representation. The do not have large-scale climatic events that were well forecast. “We need a new strategy,” says Stevens. “We need new ideas,” says Tapio Schneider from Caltech in Pasadena, California. They have that right, but they are looking for better ways to sell their alarmism and not better ways to understand natural climate. I disagree: “They have that right, but they are looking for better ways to sell their alarmism and not better ways to understand natural climate.” At least Bjorn doesen’t sells anything like ” alarmism”. It’s a very thoughtful interview with him and it seems to me that he is very clear. Stop your personal attacs! The powerful convection currents carry heat energy of evaporation at the surface, up past most of the CO2 and then condenses into water and forms ice and releases IR that is radiated to space. They do not understand the cooling influence of this. You are right that convention of (latent) heat bypasses the CO2 effect. But increase of evaporation as such increases the greenhouse effect because the energy is not radiated into space from the surface but from a higher altitude where the temperature is lower. The overall effect will also depend on changes in water content of the atmosphere, cloud cover, lapse rate. Nicely written article. ‘Often, different parameterizations deliver drastically divergent results.’ Is why models can’t deliver any probabilistic answers. 21 days out sound good. They might get it out to 10 years with 1000’s of times more computing power. I think they should go for it. Increased computing power will only help them get wrong answers faster. Climate and weather is a continuum – they give probabilistic forecasts that are good for a week or so. So initialized as well as can be and with higher resolution the less divergence. Over a decadal scale? This was a wonderful posting. It shows how bad the state of climate science really is. They have more and more confidence in models that have not gotten better. They cannot make them more accurate. More accuracy would reduce the probability of extreme results. It is nice to see scientists who are coming out of the echochamber. As far as I remember the first models had a sensitivity of 4,4 to about 6. And Mr Hansen made a hell of a noise to declare doom based on his play-thing, and so some standards were set. Prediction of behavior, even in a central-tendency, probabilistic sense, is always difficult when there are great gaps in physical knowledge of how a system really operates. For decades, the illusion has been fostered that CO2-controlled changes in radiative transfer is the “control knob” for surface temperatures, even though water vapor is by far the dominant “greenhouse” gas. Despite ample empirical evidence that heat transfer from the surface to atmosphere is usually dominated by evaporation (Bowen ratio < 1), water vapor was treated as a "feedback" and moist convection was considered but a mechanism of minor effect. By calling attention to the highly complex physics of cloud development–which has a direct effect upon insolation– Stevens at least points (much belatedly) to the hydrologic cycle as the real key to the problem. You often condemn climate science. With those astounding misstatements, it’s no wonder. There is nothing belated. It’s been a wide range since the beginning. Instead of going knee-jerk negative, see if you can figure out why he is more confident. The UN IPCC climate models don’t work. The rest just keeps a huge number of people employed. Low cloud cover feedbacks are negative. Reduced solar plasma forcing increases negative AO/NAO conditions, driving warm ENSO and AMO phases, and the positive SST anomalies drive a reduction in low cloud cover. If rising CO2 forcing could muster up the muscle to overpower El Sol and make positive AO/NAO states dominate, it would drive colder ENSO and AMO states and increase low cloud cover. Back in the late 60s when I was coding my first hydro-meteorological model, my mentor told me: there are 3 steps in the development of a model. step 1 design a model that represents reality, step 2 run the model, step 3 when the model and reality diverge, reject reality. Not only was he an out-of-the box thinker but also prescient. What make me try to have a closer look at climate science some years ago was among others my takeaway from psychotherapy research. The specific effects of psychotherapy are virtually zero (a stable result from decades of research). Nevertheless every psychotherapist claims it works and it is big business today. According to a recent Foreign Affairs article 24% of college students got psychotherapy in 2017. Up from 11% in 2007 ( https://www.foreignaffairs.com/articles/united-states/2018-10-11/generation-stress-mental-health-crisis-in-schools ). Some attribute this to helicopter parenting. The idea of therapy according to the article is to “increasing students’ resiliency”, “avoid stress” and “work through it”, “focus on prevention, detection, and treatment”. More or less the same as with agw. Freaking out about bad wheather which is supposedly due to agw to demand more therapy. Substitute adaptation with an expectation of “prevention” by helicopter bureaucrats so nobody needs to adapt and when something bad happens attribute it to agw, the white old father, a thing we know since Freud, and demand reparations. The article reminds me of this. Yes, we don’t really have too much of an idea and our models don’t really work but we are very confident we nailed the problem and ours is the way to salvation. Unfortunately only a few experts are graced to see the light in it. We should learn from them. It would be most interesting to see climate researchers examine the concept of ‘allowable states’ found in theories of quantum chemistry to describe why atoms are constructed in the discrete ways that they are. I think we can all agree that there are a few dozen recurring- and recognisable configurations of earth’s weather and transition periods of uncertainty when no-one knows for a short while exactly what will happen next. Undergraduate chemistry students will recall analytical treatises describing what happens when an atom is hit by pulses of energy of particular frequencies, some of which outcomes may involve atoms combining to form molecules. Weather systems may be describable in some kind of energy equations and inputs of solar/cosmic radiation may stimulate such systems in particular ways. The question would arise as to whether physics could successfully predict the effects of different energy inputs on subsequent weather states emerging. Since without such useful outcomes, the scientific Gedankenexperiment would be a practical blind alley. There is a great deal of knowledge available on the thermodynamic behaviour of water which currently appears to be ignored in the models. For instance at phase change, since this occurs at constant temperature the sensitivity coefficient in the Planck equation is zero. This is what is happening in the clouds, thus having considerable influence on the value of the overall Climate Sensitivity. Also; as water vapor is buoyant with respect to dry air, large energies are moved upwards as Latent Heat for dissipation, some of which, to space via the growing ice crystals in the cirrus clouds. Overall some 680 Watthrs/kg of water evaporated at the surface is dissipated by the time the water returns to earth. A quick look at the steam tables reveals this. Much of cloud behaviour may be explained by reference to the Rankine Cycle where engineers have good knowledge and experience. ; for the Hydro Cycle operates on this basis. Mere statistical observation of cloud behaviour is not the best route to understanding how clouds influence the climate. What is needed is a return to the basic science which is currently being ignored. Here I suggest it will be found that water in fact has a strong negative feedback to the purported greenhouse effect. So climate sensitivity… is likely somewhere between 1.5 and 4.5 degrees. This result has not changed until today, about 40 years later. And that’s exactly the problem. Maybe the problem lies in thinking that that is the problem. Oldbrew. Your right, the problem lies in thinking that there is a problem. Carbon dioxide is well mixed. Its effects should manifest in every month of the year. However, in the month of January, the entire southern hemisphere, has not warmed for three decades. In logic, a single exception invalidates a hypothesis. This source overcomes the problem of the paucity of data for the surface, lack of continuity, and the effect of urbanization on land, especially important given the extent of the ocean in the southern hemisphere. It uses satellite data, arguably, the best available and plumbs the entire depth of the atmosphere for a multitude of variables, a distinct advantage when it comes to cross referencing and interpolation. logic and science are different. B) the data is wrong. That is only true if your assumptions for conditions in the oceans remain true. Volcanic activity would seem to be a potential disruptor of your position. The data source you used is NCEP reanalysis. A) Re Analysis is a MODEL, MODEL, MODEL! B) it uses surface station data and host of other datasets. C) it does not “plumb” the depths of the entire atmosphere. It uses point data and then interpolates using a physics model. Stephen, I can see that you are seriously upset. Reanalysis gives me data for 15 variables at 17 pressure levels? That ‘s a pretty good plumbing of the atmosphere I would have thought. All characterizations of the surface of the Earth and its atmosphere that generalizes for a defined area (more than a single geographical point) requires interpolation and the sort of cross referencing that requires computation. You can stick with your abacus but I prefer to use a computer. And your notion that back radiation from the atmosphere can go on holiday at some time of the year…….well? It seem you have your own theory of AGW. Good for you. Your theory produces warming in the depths of the ocean and not at the surface. Good, then we shouldn’t worry, should we. Logic and science are different. Yes, I can see that in your mind, one does not require the other. Bingo! The entire approach is wrong. There is no body of mathematics or computer science that says you can model climate from first principles as is done in climate models. Rather, there is a large body of theory and experience that says it won’t work. Faster computers are not the solution. They simply allow you to calculate the wrong answer faster. But it does not tell you over what time period. ECS is a good metric to give an estimation of the total heat captured by the earth which initially is mostly by the oceans and how that will be manifested eventually as a global temperature increase. 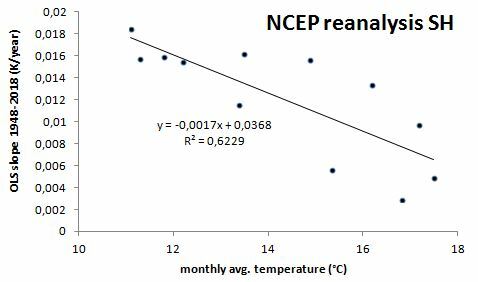 TCR is a metric that gives a better picture of temperature within a time constraint. Comparing observed temperature evolution versus climate model estimations in the historical time period is probably better done using the feedback parameter. Modeled global temperatures, which are dependent on the intrinsic feedback parameter, can be brought into better alignment with the observed global temperatures by using the not well constrained forcing and ocean heat content (OHC) changes in the models whereas feedback parameters for models can be determined independent of historical temperatures using the 4xCO2 and 1% CO2 experiments and methods. For the observed global temperatures an energy budget model is available for estimating a feedback parameter. While that estimation depends on rather uncertain observed values for forcing and particularly for changes in OHC, I judge it a better comparison than that using global temperature series trends which can be shown rather convincingly to be adjusted in models using forcing and OHC changes. I wonder if hybrid analog-digital computing is something to look into. The best computer is an analog computer, the original analog computer, earth. Earth is the analog, the real one, the data was created and archived in ice core records and other proxies and the simulation is still running after billions of years, recording more data as the time advances. Study the actual data, not human generated model output, It does not agree with the real stuff. Larger, faster, smarter computers will not solve this problem. Model’s can’t outrun or out-compute sensitivity to initial conditions, structural instability, and our current ignorance of the forces that cause climate changes (those that we lump together as “natural variability”). With better computers, and smaller gird sizes, we might get a few more years of approximate projections in before the models are simply mirroring the chaotic results inherent in numeric computation of non-linear dynamics — but the real possibility exists that with smaller grid sizes, we might hit the point of chaos outbreak even earlier! Better computers will help or hurt. The only help can come from better understanding natural climate cycles and that can help heal the computer models. Incorrect theory will always end up out of any real bounds. Earth has had ever changing real bounds, with sometimes abrupt changes from one series to another, but never chaos. Chaos is perceived because the natural causes are not understood. The natural causes of the big cycles is explained in the ice core data and in the data from other proxies. This data is a record of output from the only correct simulation of climate, the earth system. The data has been provided to us but we look at flawed computer model output instead. Go figure! popesclimatetheory ==> A deeper, better understanding of the actual causes involved in creating the Earth’s climate — both those we already know something about and those of which we know nothing (and are thus lumped under “natural variation”) — are a necessary starting point. Numeric climate models are inherently “chaotic” in the Chaos Theory sense as they are numeric representations of non-linear dynamical systems. I agree totally that the Climate Past is our best simulation of the climate — if we could only figure out all the bits and pieces. Running flawed models might help us sort things out — but it will not project/predict future climate states. As a physicist, but relative “climate science” layman, and after much reading of literature, my first question is about motivation: what is motivating the IPCC and those funding its modeling research to make so many questionable assumptions about climate forcing complexities (among other things) while ignoring what seem to be simple empirical data? What am I missing? Why does the IPCC seem to “need” catastrophic outcomes, and what is the root cause behind this view? The UN grasping for power. Politicians’ need for more scary stories to motivate the masses. And money, money is power, scary stories promote more expensive electricity and more expensive vehicles and windmills and solar panels, which makes many of them very rich, and promotes the loss of manufacturing ability and economy so that people will embrace a savior who will enslave us to save the world. Books have been written about these tactics. Somehow, a power-grab and old fashioned greed just don’t seem to explain the deep seeded convictions that we see/hear almost every day. At least not to me. Motivate the masses to what end, and why? A “savior”? I’m just a humble physicist, so I guess I’m looking for how could so many supposedly well meaning scientists head down this road, and become so pre-invested in a concept that they are willing to suspend all of their scientific training and education, never to try to self correct when their theories seemed to fail. I know I’m missing something. Again, thanks for taking the time. James, were there no doomsday predictions for climate change, there would be no need for the various and sundry bureaucratic agencies, academic departments, PhD graduates, grant funds (going not only to research but towards huge university administrative overheads), fear-based donations to green NGOs and grants, loans and other subsidies going to well connected political donors. The whole structure of CliSci and the renewables industry would collapse overnight. It is not only that hysteria sells news, but the predominance of media organizations and the people working for them are left-wing/socialist. The whole nonsense of ‘sustainable’ economic development is driven by ideology that seeks to control people “for their own good.” Modern day bluenoses and busybodies; they just can’t stand it that people are doing things for which they disapprove. Read about the Peter Ridd case. When a scientist disagrees with the consensus, they lose their job, their way to make a living and they cannot get a job with anyone else because they are blacked balled. They head down this road or they get kicked off the road. Climate scientists must sign up for the consensus to become climate scientists, they do not pass their course work and get a degree if they disagree. The climate scientists who disagree, most often became climate scientists due to the work they did, not an initial school degree in climate science. James, Richard Lindzen has some ideas how and climate science was corrupted. This post is a synopsis with link to his larger publication. We must become more sophisticated at “coarse graining”. Trying to model the position and velocity of every pixel in a thunderhead is like trying to know the position and velocity of every molecule in a pineapple. Currently no can do, conceivably never will. We naturally coarse grain all the time. Without concern for the microscopic substructure we easily identify big, small, and deformed thunderheads and pineapples; and understand the implications. Little selection pressure has been brought to bear on our gifts for coarse graining climate. We tend to wax superstitious. Recent advances with oscillations (the “O’s”: PDO, AMO and such) are a good beginning at coarse graining. In the last few months there have been major new discoveries in human anatomy. You can bet that as climate is dissected in coming hundreds of years, new coarse graining opportunities will appear. Pingback: Why climate predictions are so difficult | Watts Up With That? “A complete theory of climate variability andclimate sensitivity, across the entire range oftime scales of interest, is still in the future.” Michael Ghil, UCLA, in a 2013 paper. There still is no theory of climate sensitivity, it is therefore not known if it exists, either deeply embedded in the climate system fundaments or an emergent property of the climate system, or a figment of computational imagination and numerical shortcomings. Is it safe to assume that this will continue indefinitely leading to glacial inception? No. “Past performance in not a guide to future performance”. What applies to financial markets applies also to climate. If the fractional coverage of low-level clouds fell by only four percentage points, it would suddenly be two degrees warmer worldwide. Such acute sensitivity to cloud cover, combined by the apparently contradictory fact of climate stability, constitutes evidence that clouds and cloud cover are self-regulating, a kind of chaotic-nonlinear network. This perspective supports the concept of Gaia. It also is supportive of the plausibility of the Svensmark cosmic ray – cloud hypothesis.